Ferrari’s Luca Di Montezemolo is to step down as long-time chairman of the Formula 1 team. His departure follows a poor season on the track and disagreements with Sergio Marchionne, chief executive officer of parent company Fiat. 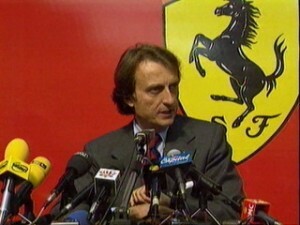 Marchionne will replace Di Montezemolo, who leaves the role on 13 October. Ferrari have not won a drivers’ or constructors’ title since 2008 and are in the midst of their least competitive season for 20 years. The team had their worst result of the year at the Italian Grand Prix on Sunday when Fernando Alonso retired with a hybrid system failure and team-mate Kimi Raikkonen finished ninth. It is in stark contrast to their dominance of F1 in the late 1990s and early 2000s when seven-time world champion Michael Schumacher led the team to six consecutive constructors’ championships. Marchionne also described the recent disappointing performance of Ferrari’s Formula 1 racing team as “unacceptable” and said it was “absolutely non-negotiable” that Ferrari should win Formula 1 races. Under Di Montezemolo’s tenure, Ferrari increased revenues 10-fold and tripled sales volumes as the Italian family business grew into one of the world’s most powerful brands.